The flow diagram shows the services that we offer. Why a flow diagram? Well, we’re always learning, and experiences in one service area often inform advice we give elsewhere. This helps our clients avoid costly errors in design and construction. For instance, during forensic work on defective cladding, we get to see cladding design, components and materials at work. We test systems and take them apart and find out why they went wrong. We help with materials analysis too, identifying failure limits and incompatibilities. We then work with clients to rectify the problems. If the circumstances are contentious, we work with our clients’ legal advisers and explore who is accountable for the defects and to what extent. We can then help our clients recover any potential loss. These experiences inform our work on the design and specification of new façades. If we think a design will not work, we will say so and explain why, by giving examples when practicable. This advice can be invaluable and help our clients avoid expensive mistakes. 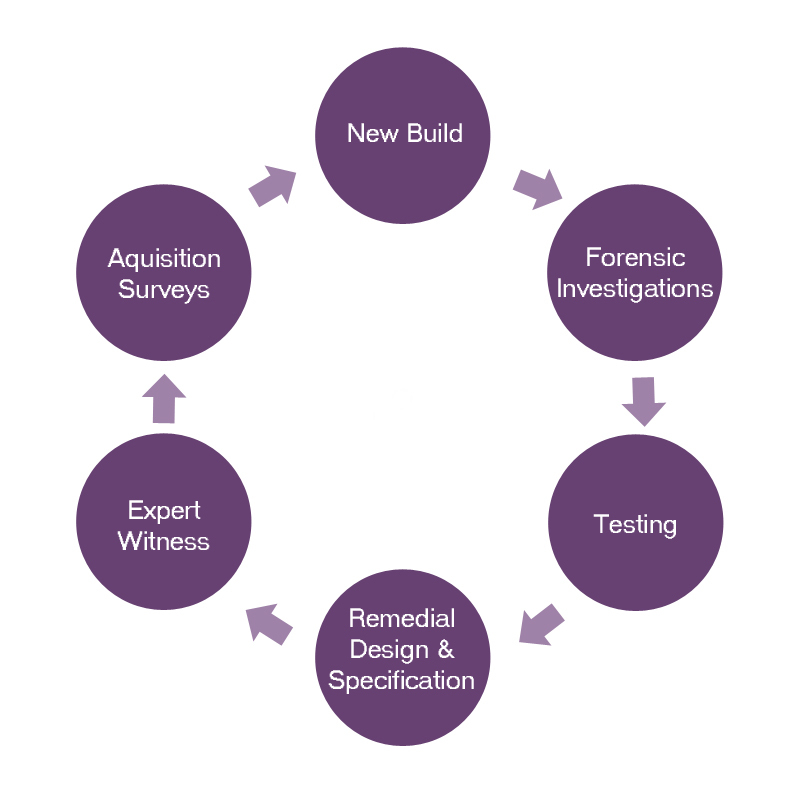 When appraising buildings for buyers, our forensic and new build experience helps us look for clues to potential problems with design, fabrication and installation. If faults are found, our clients can then decide whether to purchase the building, with an informed picture of the risks and defects involved. We work on major developments, typically large commercial buildings or, multi-unit residential blocks. Unfortunately, building facades can go wrong. Poor design, fabrication or installation can be the cause; sometimes all three. We’ve spent so long witnessing façade testing, we could write a book about it. We have witnessed tests throughout the UK, in mainland Europe and Canada. Since 1996, we have been continuously involved in contentious work providing necessary evidence describing defects and their causes. We are usually asked to design and specify repairs when forensic investigations discover faults. This can involve presenting clients with different design choices varying in cost. Building facades can cost 15-25% of the construction price, making them an expensive building feature.